Carnival of Terror is a simple shooting game. You're in the Deserted Fairgrounds, and robotic clowns are running around and throwing pies at you. You must shoot the clowns to gain points. If you run out of health, ammo, or time, your game is over. The three labeled bars at the bottom of the screen will show you how much health, ammo and time you have left. If a pie hits you, you lose 1/10th of your health, so your game will end once 10 pies hit you. You start with 99 shots; after your 99th shot, your ammo bar will be empty, and your next shot will not count for any points and will end your game. The game should last somewhere around 100 seconds (depending on the speed of your computer) and will end when you run out time. You can get extra health, ammo and time by shooting the bonus items. Use the mouse to move your crosshairs around the screen, and use the left mouse button to shoot. The robotic clowns are made up of several different parts which you can shoot, and some parts give you more points than other parts. When a pie comes flying towards you, you can shoot it to avoid being hit by it and losing health. You can also gain certain bonuses by shooting the bonus items that parachute vertically down the screen. On the main title screen, you can choose to view the instructions, to turn the music and/or sound off, or to start the game. During the game, you can shoot the "End Game" button to end your game. Each clown has a head, an arm, a set of legs, and an inner body. Some clowns also have umbrellas. Occasionally, the clowns will throw pies at you, and you can also shoot the pies. Shooting each of these things gives differing amounts of points, as shown in the table below. Shooting these items that parachute down from the top of the screen will give you bonuses, as shown in the table below. Type piecrust once per game to restore your ammo to full. At the start of the game, type "piecrus" and then when your ammo bar is completely empty, type the final "t" to regain all your ammo. Make sure not to shoot when you have absolutely no ammo left, as this will end your game! You must watch your ammo bar carefully to make sure that you use the code at the right moment. Type custard to restore your health to full. You can use this code if you're running dangerously low on health, but you probably won't need it. Secret: Before starting your game, go to the instructions. Then keep hitting the "more" button until you get to the third page (the one where all the bonus items are pictured.) The picture of the clock is clickable. When you click on it, you should hear a ding sound. The effect of clicking the picture of the clock isn't known for certain, but it's possible that it will cause more bonus items to appear during your game. Once you've clicked the picture of the clock, hit the "go back" button to get back to the main page and start your game. Each clown's inner body is mostly covered by its head and legs. Shooting the clown's inner body will destroy the clown. Shooting any other part of the clown will simply remove that part without destroying the clown. Shooting a clown's umbrella will make it fall quickly out of the sky and onto the ground. There is a small space between the clown's head and legs where you can shoot in order to hit the clown's inner body and destroy it immediately without shooting any of its other parts. Below, outlined in red, is the area where you must shoot to destroy the clown's body. However, in order to maximize your score for each clown, you may want to shoot some of its body parts first before destroying its inner body. It's also easier to destroy a clown once you've removed either its head or its legs, as removing the head leaves the top part of the clown's inner body exposed, and removing the legs leaves the bottom part of the clown's inner body exposed. Removing the head or the legs will give you a large target to aim for in destroying the body, as opposed to the tiny strip of inner body that is exposed before removing the head or legs. If a clown lacks its legs, it will start moving slowly backwards. If a clown lacks both its arm and its legs, it will start moving quickly back and forth and eventually explode. If this happens, make sure to shoot the clown's body before it explodes; the clown's body is worth the most points, and you'll lose out on those points if it explodes. The ammo and time bonuses are extremely important. Any time you see an ammo case or a clock, make sure to shoot it. Ignore the health packs. Keeping your health high is not very hard, and the pies don't take away very much health anyways, so there's no reason to waste ammo by shooting the health packs. If you do start running low on health, you can just use the custard code. Below is an in-game screen shot which shows many of the things discussed in this guide. If you shoot every single part of every single clown, you'll run out of ammo too quickly and your game will be over. The umbrellas are only worth one point, so you shouldn't bother shooting them at all. The clowns' arms are worth slightly more points than their legs and heads, so it's a good idea to shoot a clown's arm first. The clowns that are off in the distance are small targets, and you may not be able to properly aim for their arms, but you should definitely shoot the arms of the clowns that are close to you. After shooting the clown's arm, you can shoot its head in order to gain points and make it easier for you to aim for its inner body and destroy it. 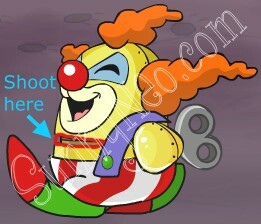 Shooting the clown's head is a better option than shooting its legs, because it avoids the problem of the clown becoming explosive. If you're running low on ammo, but still have lots of time left, you may want to stick to shooting the parts of the clown that have higher point values, such as the inner body and possibly the arm. 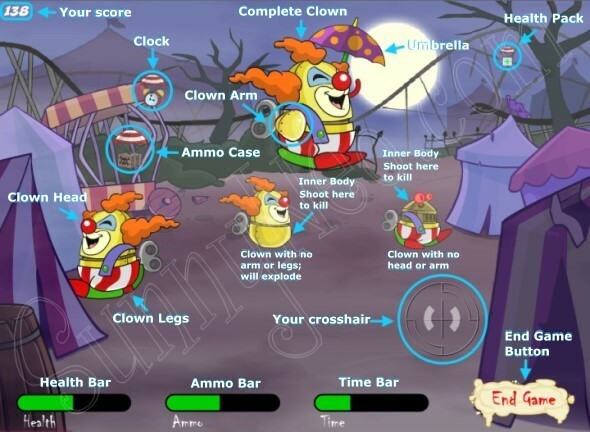 On the other hand, if you're running out of time but still have plenty of ammo, you can shoot every single part of each clown to maximize your score before time runs out. Try to destroy every clown before it runs off the screen. The inner bodies are worth the most points, so you don't want to let any of them get away. If there are many clowns on the screen, you won't have time to take each of them apart piece by piece, so you should just concentrate on making sure you destroy all of their inner bodies before they run away. If you have to let any clowns go, let the ones off in the distance go, because they are small targets and may cause you to waste ammo in attempts to destroy them. Try not to shoot at a clown unless you're sure you can hit it, because you really don't want to waste your ammo. If you have trouble shooting the tiny clowns that are way off in the distance, it's best to just ignore them instead of wasting your ammo. Pies are only worth one point, so some people choose not to shoot them. The pies don't take away much health, so that's not a big worry, though you may start running low on health if you let every single pie hit you. However, the pies will blind you for a short amount of time when they hit you, and this can make you miss out on shooting some clowns. The pies seem to come most often when there are many clowns on the screen, and being blinded while there are lots of clowns can easily result in some of the clowns getting away before you get your vision back. In the end, it's your own choice as to whether it's worth it to use your ammo to shoot the pies in order to avoid being blinded and losing health. If you have a slower computer, the pies will blind you for longer, so this may factor into your decision as to whether or not to shoot the pies. Practicing your shooting will help you become a better shot and avoid wasting ammo. Aside from practice and following a good strategy, this game also has a big luck factor. If lots of time and ammo bonuses appear, then your game will last longer and you will score higher. That's why it's so important to watch for the clocks and ammo cases, and to shoot every single one you see, even if it's off in the distance and is hard to aim for. If the game doesn't give you many clocks or ammo cases, you won't get a high score. You just have to keep playing the game until you get a lucky game where lots of bonuses appear. Luckily, the bonuses aren't too terribly rare, so a lucky game can happen fairly often. If you use the strategy outlined in this guide, and practice your shooting, then you'll be able to make the most of your lucky games and get a high score. Hopefully by following this guide you will be able to obtain the avatar below. Score 725 or more points at Carnival of Terror. custard:	Restores your health to full. One use per game. piecrust:	Resets your ammo to full. One use per game. ▬▬▬▬▬▬▬▬You are my next TARGET!